We wanted to give you an update on our Aeroplan Redemption Stories: The Good, The Bad and The Ugly. We are compiling all the stories we received and are also going to get Aeroplan's responses to the piece. It should be up on the Rewards Canada blog by this time next week! According to Airlineroute.net Air Canada will no longer offer their Toronto-Milan service year round. The last summer season flight will be on October 16th. If you are booked on this flight after that date we recommend contacting Air Canada to see what routing they'll put you on rather than waiting for them to contact you. KLM's Wild on Wednesday offer is here. 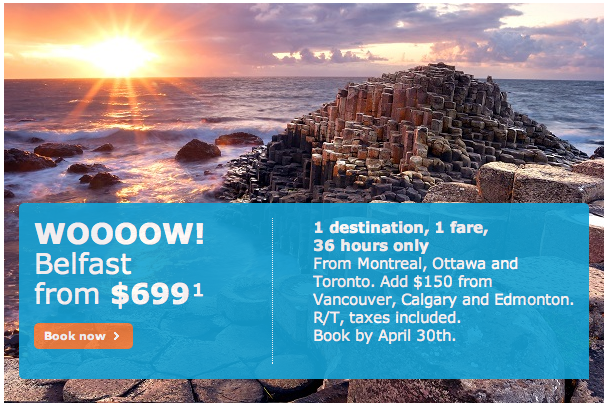 This time its for flights to Belfast and they start at $699 all in for departure between May 7th and June 18th 2015 or between September 11th and October 15th 2015. Simply book by April 30th! Find out more and book here!